The KN-8828B-2K offers full manual control and is our recommended choice for users who are prepared to adjust roast parameters manually throughout the roast to achieve the best possible results. It is without a doubt the control system for the purist home coffee roaster. 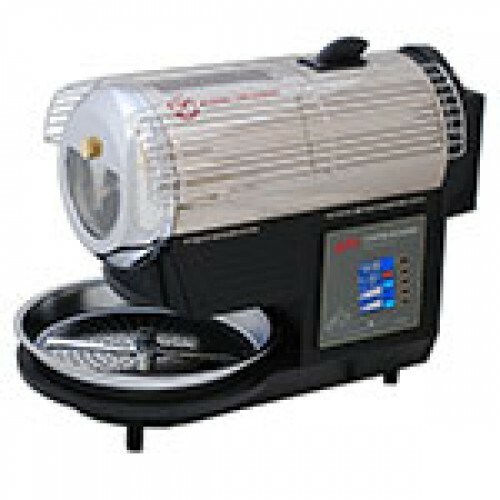 A manual roasting solution which provides an excellent roasted result. When you turn on the KN-8828B-2 you can roast in 'auto' mode or use one of three built-in memory locations. Once you have selected one you can enter what's called a 'target time' and 'target temperature'. We don't like the terms 'target' because it implies the controller is aiming for these settings which it isn't - these are simply points which, if reached, will cause the roast to be automatically ejected so we prefer to call them 'auto-eject' points. If you've got a roast profile well established you can use these if you wish but we prefer to set them to maximum (25 minutes and 220oC) so neither are ever reached and they don't interfere with our settings. Having done that you press the Start button and the drum will commence pre-heating. Once the temperature in the drum reaches 75oC the controller will beep at you to advise you to add the beans to the drum. The control panel will now show time remaining, as well as current drum temperature, heater power setting and fan speed setting. You can cycle through these four settings and change any you wish at any point (on time and temperature you'll change the auto-eject points, not the current readings). Once the roast is ready you can press the Eject button. The roasted beans will be ejected to the external cooling tray and cooled to ambient temperature within a few minutes. Once this has happened you must empty the chaff tray before commencing another roast, and will have the option to save the roast profile you created to a memory location. hottopusa.com has a wealth of information about Hottop roasters which we don't intend to replicate here, including more detailed model information, troubleshooting, repair procedures and more. We'd encourage you to visit their site if you wish to gain more detailed information about Hottop roasters. If you report a fault with your roaster to your retailer within 28 days of the date of shipment, the retailer will cover the cost of its return to us for inspection and the cost of freight back to you. If the unit is not faulty we reserve the right to request payment for the return postage prior to returning your roaster to you which they may pass on to you. If you report a fault with your roaster to your retailer after 28 days of the date of shipment but within the warranty period, you are required to pay to ship the roaster back to us where we will inspect it, then we will pay to ship the roaster back to you. If you report a fault with your roaster to your retailer outside the warranty period, you or the retailer need to pay shipping both ways. Any components that we determine have failed in the course of normal use within the warranty period will be replaced at no parts or labour cost to you. WHICH MODEL - B OR P?